At the heart of the masterpiece story lies the story of how Jesus was led to a dissolute girl, and for her sins they wanted to be stoned to death. In turn, the savior asked people about their lives. Surely none of them had sins. It turns out that everyone is sinless. 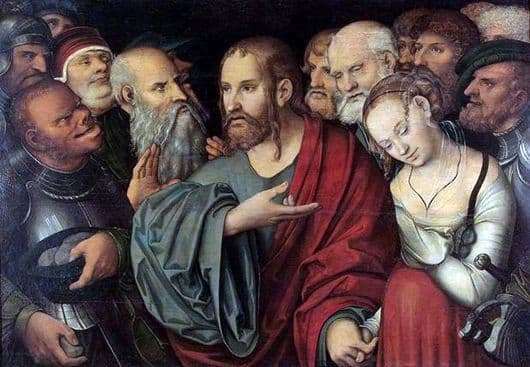 Christ decided in his own way: “Let him who is without sin throw stones at her.” In response, silence, the people lowered their eyes and quickly moved away from the girl. The canvas depicts the beginning of this discussion. The girl lowered her eyes, she fearfully pressed herself against the Savior. People surrounded Christ from all sides. The artist creates the impression of a crowd that, with its anger and cynicism, is trying to get Christ to kill. Lucas Cranach conveys all the sensuality that overwhelms his soul. The painter’s palette of colors is diverse, the faces of people of natural colors, and the clothes of the usual type of the time. Apostles, scribes – everyone wants punishment, but there is justice. Jesus holds the girl by the hand, not letting go. The kindness of God’s disciple exceeds all expectations. Revenge is not an option, you need to love and respect each other, and harmony will come. The theme of religion is the main feature of the Renaissance. Art lovers see true purity and loyalty in the paintings of Cranach. The rebirth of life and love. Refusal from a sinful life, the request of the artist to be pure and frank delights. Artistic work is filled with beauty that does not harm, but simply will inspire. Lucas Cranach the Younger – a representative of the cultural era of the Renaissance of body and soul in painting.